Now that we’re in the season for gift-giving, I’m going to start a new series of gift suggestions, all of them books by veterans of Taos Toolbox. You can’t have too much reading, right? 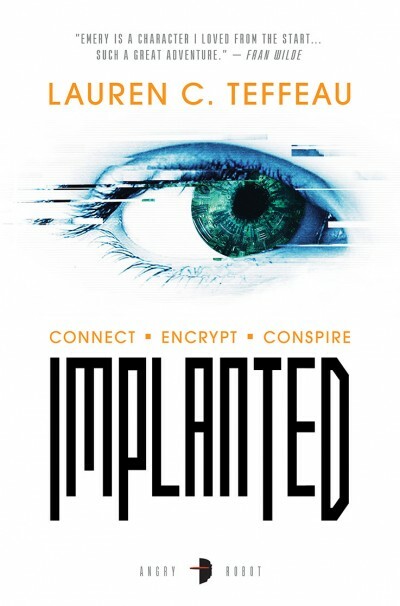 First up is Implanted by Lauren C. Teffeau, available as a paperback, ebook, or audio book from Angry Robot. When college student Emery Driscoll is blackmailed into being a courier for a clandestine organisation, she’s cut off from the neural implant community which binds the domed city of New Worth together. Her new employer exploits her rare condition which allows her to carry encoded data in her blood, and train her to transport secrets throughout the troubled city. New Worth is on the brink of Emergence – freedom from the dome – but not everyone wants to leave. Then a data drop goes bad, and Emery is caught between factions: those who want her blood, and those who just want her dead. There’s more information at Lauren’s web page. I purchase all books I can from Kobo because Carmichael’s Bookstore (Louisville, KY’s oldest independent bookstore) then gets 40% of the cost. Gots to support our local bookstores! This is an excellent recommendation! Purchased, loaded onto my Kindle and added to the ever longer list.